Last weekend, my husband and I took our kids to their first amusement park visit. Our kiddos are K-girl, age 8, G-boy, age 6, and M-girl, age 4. I was really excited to show them what amusement parks are really like, since their only similar experience so far has been at the fall fair, which is super fun, but I wanted them to see what big rides are like, too. Despite getting caught in a torrential downpour complete with thunderstorms that forced the closure of the water park, we had a blast. We made our way to Canada’s Wonderland as part of a road trip from Kingston to London, Ontario in our new (to us) RV. It’s a much different experience than riding our bicycles, that’s for sure. But neither is better. They’re just different. I must say, though: the RV came in really handy after getting caught in the rainstorm. We left the park, hopped on the RV, changed our clothes, had some treats, and got warm while waiting for the rain to pass. Then we went back into the park and kept on having a good time. There are so many awesome things to check out at Canada’s Wonderland. Even if you’re not into roller coasters, there are plenty of smaller rides to help you have a great time. This time around, I checked out Kidzville and Planet Snoopy for the first time. Since I’ve always gone by myself or with a group of adults, I’d never been to the children’s part of the park. It’s really nice, and I actually had a lot of fun on the kiddie rides with my little ones. Except the Silver Streak. The Silver Streak is the mini-roller coaster in the Kidzville area of Canada’s Wonderland. It’s meant to be an introduction to roller coasters for the kids. You sit in a chair that’s suspended from the top of the track, with your feet hanging down. I found it too jarring, and my neck and back hurt afterwards. Having said that, the chair you sit in is quite comfortable. I personally wouldn’t go on it again, but my 8-year-old daughter loved it. One note to remember is that if you’re over 6’3″, you’ll be too tall for this ride. One ride that was super fun for both the kids and me was the Flying Eagles. It’s a really neat ride that goes around in a circle, but you have a handle attached to a “blade” that you can use to control the carriage you’re sitting in. You can just sit and go around, or you can make your ride a little wilder. I sat with my 4-year-old and we had fun making our carriage go pretty wild. My 6-year-old boy sat behind us and had fun controlling his own seat as well. There are some rides in Kidzville that are only for young children to ride on their own. I was thankful they had a ride similar to the Swing of the Century, but for the little ones. My 4-year-old was really disappointed she couldn’t go on the big swing ride (she’s not tall enough), so she was pretty happy that there was another similar ride, Swing Time, made “just for her.” My 8-year-old was also within the height requirements, so all 3 kids rode that one and enjoyed it. The other ride the kids enjoyed on their own was Snoopy vs The Red Baron. This is a little airplane that the kids have some control over as well. The airplanes go around in a circle, but the children have a stick they can use to move the plane up and down. Unfortunately, there’s not much instruction before they hop on the ride, and poor G couldn’t get the plane to go up. He was pretty upset when he left the ride, but we just got him to join the line again and showed him that you have to push the stick forward for the plane to move upwards. After that, he was happy again. One ride that G-boy and M-girl really enjoyed was Jokey’s Jalopies, a little antique car that they can “drive” on a track around the park. It’s actually a pretty long route, and the kiddos took turns “driving” the car while we spotted woodland creatures made out of wood panels in the forest. It was a good time. We wanted to go on the little trains as well (Kidzville Station), but unfortunately, I didn’t realize that part of the park closes an your earlier than the rest, and we ran out of time. To make up for it, we took the kids on the Antique Carousel as the last ride of the night. Another ride we went on with the little ones was the Swan Lake. It was a cute little ride around the lagoon, but I felt like it was too short of a ride for the amount of time we spent in line. That comes with the territory, though. There was also a wooden roller coaster in the kids’ part of the park that was a lot of fun: the Ghoster Coaster. It has two drops and goes fairly fast. M-girl had a look of terror in her face as we were going down the hill, but said “it was so much fun” afterward. K-girl was tall enough to ride The Bat roller coaster, which is outside the kids’ area, and she loved it. Which makes me really happy, because The Bat is one of my favourite rides at Canada’s Wonderland. It’s a pretty close tie with Leviathan (which all kids were not tall enough to ride, so I didn’t go on it this time around). K-girl rode The Bat once with daddy and once with me. This ride has one big drop and one loop, and then goes backwards through the same trajectory. It’s awesome. We were able to enjoy Splash Works, the water park, for a couple of hours before the rain and thunder shut it down. The kids enjoyed Lakeside Lagoon (a very large wading pool), the Lakeside Lagoon Slides, and some other fun rides. Me, G-boy, and M-girl went on Whilrwinds, a long white slide that’s super fun. This one you have to ride by yourself, but M-girl was tall enough to ride it. Both her and G-boy loved it. My suggestion for parents and kids going on this slide is that the parent goes down first and waits for the kids at the bottom (to prevent any freak outs for the little ones). I told the lifeguard I was going down first and told both kids I’d wait for them at the bottom. You have to clear the little pool you fall into right away, so I just waited on the concrete right in front of it. Once the kids came down, I quickly went into the pool to grab their float and help them out of the pool. It worked out well. After Whirlwinds, we went on The Plunge, a super bumpy, super fun pink slide that you can ride 2 to 3 riders at a time. I rode it with M-girl and G-boy, and Dan rode with K-girl. The entire time we were going down, M-girl had a terrified look on her face, which made me think she wasn’t enjoying herself. But as soon as the ride reached the pool at the bottom, she says “That was so much fun!!! Let’s do it again!! !” Sometimes she reminds me of Baby Sinclair in Dinosaurs. Anyway! Some other rides we went on with the 8-year-old were Klockwerks, Spinovator, Boo-Blasters (apparently this may be too scary for the little ones, according to K-girl). 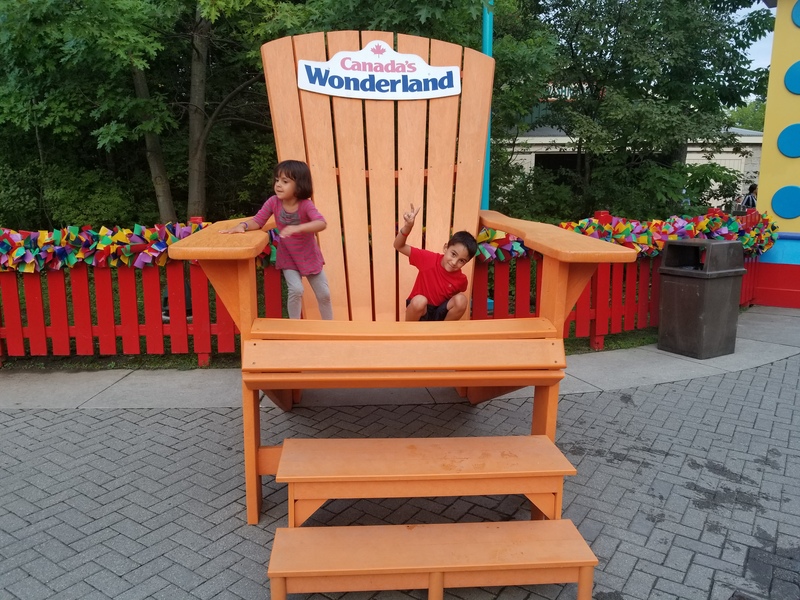 Initially, I thought it might be difficult to take the little ones to Canada’s Wonderland, because my oldest can ride on several rides that the little ones aren’t tall enough for. I thought that might create some problems, but other than a little whining about the Spinovator and the Swing of the Century, we were totally fine once we took the little ones to the kid’s part of the park. There are a tonne of rides appropriate for the little ones, and you can certainly spent a whole day in Kidzville and Planet Snoopy with the little ones. I definitely recommend Canada’s Wonderland for a fun outing with kids. Keep in mind to budget for extra expenses as well. We had our RV with us, so we just came to the RV for our lunch and dinner. If you’ll eat at the park, especially with a whole family, do ensure to have a healthy budget. Meals can run around $20 per person. There are also some attractions that cost extra, such as the Go-carts and the many games you can play. You can, however, have plenty of fun with your admission pass alone. My recommendation is that you set a budget and discuss with your kids what will and won’t be done ahead of time. We explained to our kids that we were there to ride rides and that we wouldn’t be purchasing extra games. We also let them know that we’d be eating in the RV. Other than more than a few “can I just play a game, please?? ?” from my oldest, our plan worked out pretty well. Leaving my wallet in the RV was also a good call. It’s also helpful to have a plan of action if you and your kids get separated for any reason. We recently purchased Road IDs for the whole family. We told our kids to look for a security guard or an employee (we explained what their clothing looks like) and show them their bracelets, should we get separated. Luckily, that didn’t happen, but we were prepared, just in case. All in all, we had a great time, and can’t wait for our next amusement park visit. We’re planning a big trip in the RV soon—what amusement parks should we check out in the US and Canada? Previous Previous post: Setting Goals That Actually Work—FREE Worksheet!